PROFILE - 伊東光介／Kousuke ITO 作曲・編曲・ピアノ etc. 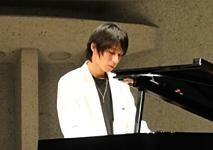 Kousuke ITO is a composer, and a musician doing improvisation. Graduate from Tokyo University of the Arts, composition department. During　university student, he mastered study of the improvised in Paris, France. He won at Accord publication prize contest and his work was elected as a commission. Lately, he is enlarging his place of his activity in TV-commercial and so on. Now, he works at a laboratory of medical corporation Inagi-dai Hospital (musical therapy),teacher of Musashino Academia Musicae attached university and senior high school music department. His activity is very wide.